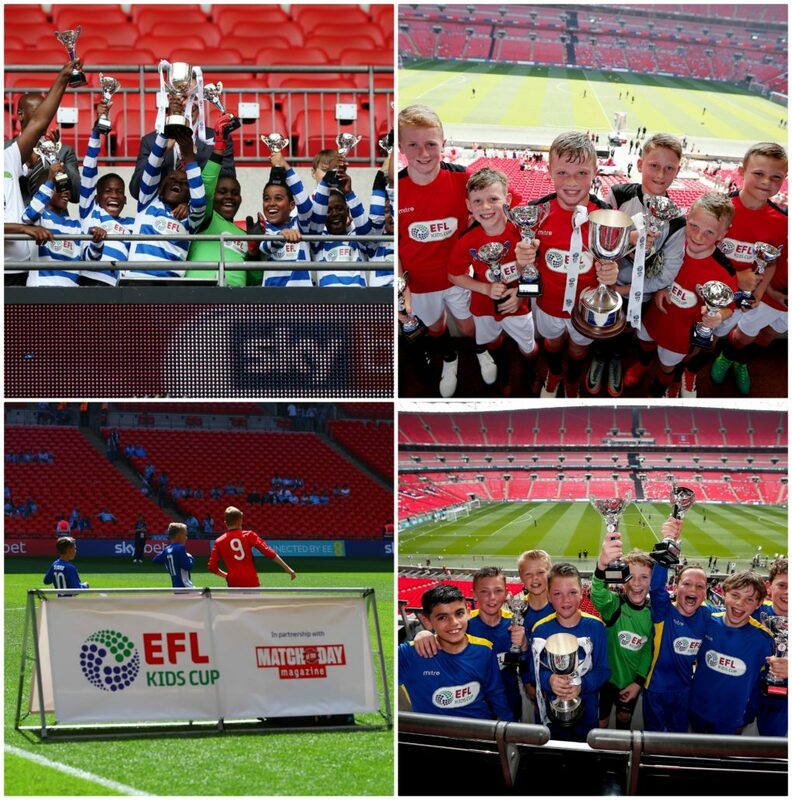 For 48 children, a dream became a reality at the weekend as representatives from Queens Park Rangers, Sheffield Wednesday, AFC Wimbleon, Oldham Athletic, Colchester United and Morecambe grasped their opportunity to play on the Wembley turf in the EFL Kids Cup Final. 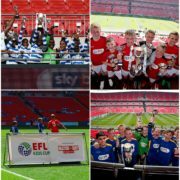 Over 16,000 youngsters and 1,800 schools took part this year in six-a-side tournaments organised on behalf of the EFL and EFL Trust, with the 72 EFL clubs firstly split into three divisions, in line with the club’s divisional status, before being again split into two groups, north and south. 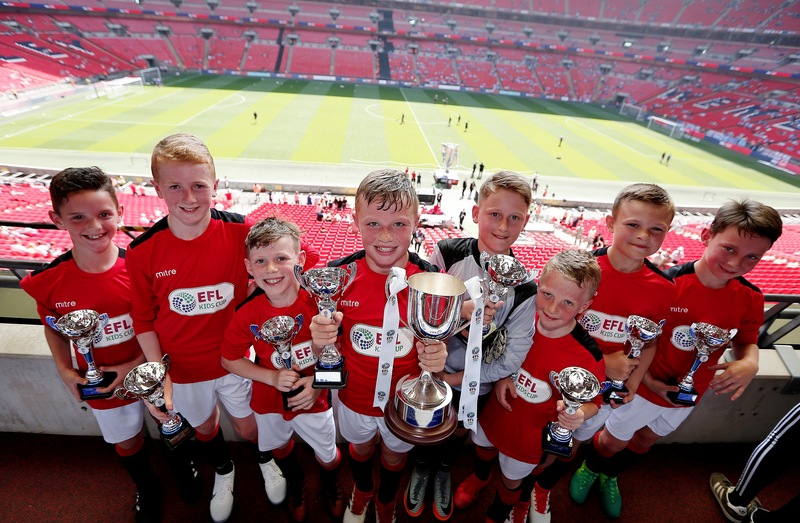 The six winners of the northern and southern finals in each respective division are then given the opportunity to be crowned Kids Cup champions at Wembley before their represented division’s Play-Off Final across the Bank Holiday Weekend. So, who are the schools and the children that earned a once in a lifetime experience and who was crowned champions at the weekend? 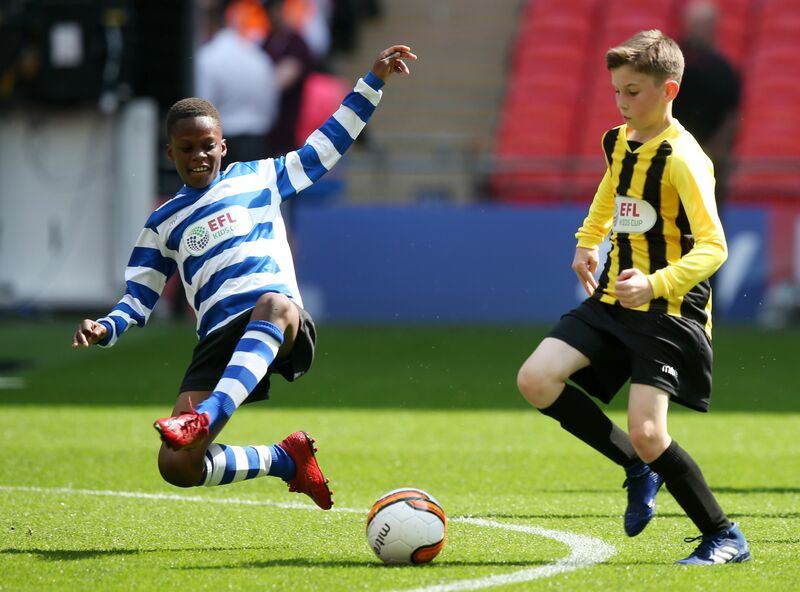 QPR and John Keble Primary school progressed to the Wembley showpiece after beating Aston Villa, who topped the standings at the end of the group stages, before a narrow 1-0 victory against Cardiff City in the regional Final. Team: 5. Elluyani Passos ©, 1. Daniel Matuka (GK), 6. Jimmy Nguyen. 7. Christopher Eldemire, 8. Toure Downer, 9. D’Jahnni Smith, 10. Donte Ranger, 11. Reshaun Da Silva. Underdogs going into their regional Final, Sheffield Wednesday and Greenhill Primary School defeated a Hull City side who had yet to concede a goal leading up to that stage. Once again, one goal was enough to seal their place in the Final. Team: 9. Callum Milner ©, 13. Thomas Everest-Wilcock (GK), 2. Lucian Hagin, 4. James Wilson, 15. Toby Smith, 16. Daniel Birch, 17. Tommy Snell, 18. Jude Akram. A convincing 3-1 victory sealed it for The Hoops as they got off to a perfect start with Reshaun Da Silva firing home from close range. QPR’s advantage was doubled at the break thanks to a fine solo goal from D’Jahnni Smith, who also doubled his tally after half time, coolly slotting beyond the goalkeeper to make it three. 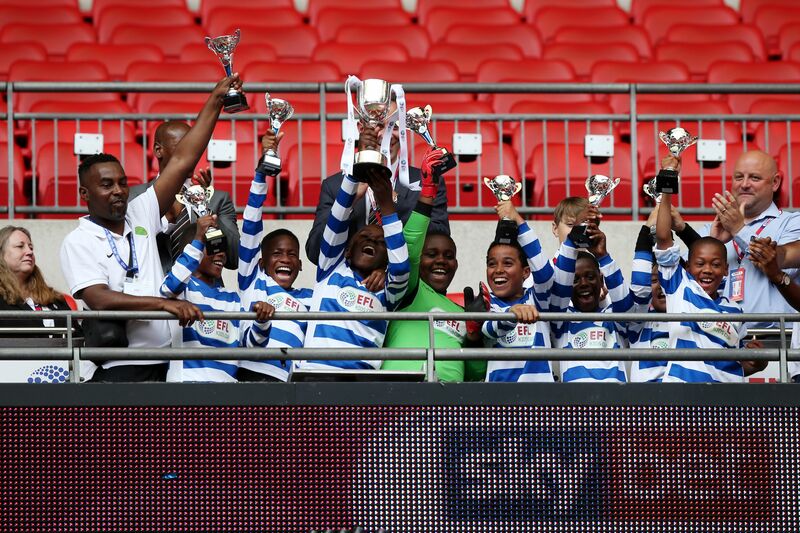 Wednesday grabbed themselves a late consolation courtesy of a Callum Milner header, but i was all in vain as QPR – and John Keble Primary – celebrated victory at the final whistle. “It’s a great achievement for the boys and I think they deserve everything they got today,” said John Keble Primary teacher Eddie Prempeh. “It’s a once in a lifetime opportunity to play at the National Stadium and it’s been the talk of the town for a while. 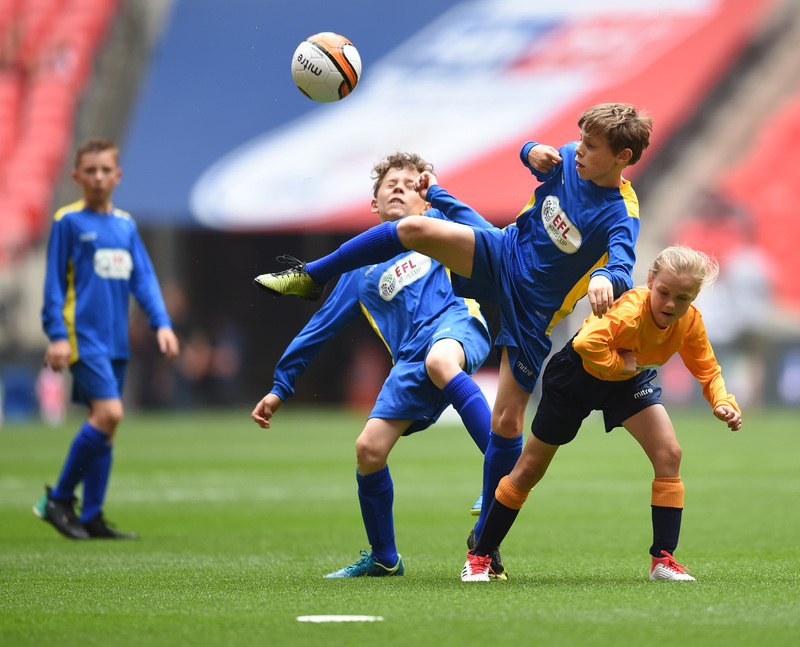 A former winner of the EFL Kids Cup, Cleves school returned to Wembley Stadium hoping to win the competition for a second time after defeating Southend 1-0 in the regional Final. Interestingly, what makes it even more special for the school is that four of the boys playing this weekend had older siblings in the team that played, and won, at Wembley two years ago. Team: 11. Edward Roberts ©, 1. Samuel Honour (GK), 3. Ben Vigrass, 6. Frank Vigrass, 7. Joshua Lewis, 8. Oliver Swetman, 10. Sami Holmes, 17. Charlie Davidson. Another former winner of the competition after their success in 2013/14 against Crawley Town. Returning to similar surroundings. The team’s number 9, Amalee was only the second girl to appear in an EFL Kids Cup Final. AFC Wimbledon raced into an early lead when Joshual Lewis redirected a low drive, finding the net with the Oldham goalkeeper wrong-footed by the deflection. The Latics pushed for an equaliser but found themselves two down when a devastating counter attack was finished off by Lewis, and Sami Holmes finished equally emphatically when making it three before the break. Oldham never gave up, holding firm as the kids of Cleves School pushed for a fourth, but it was AFC Wimbledon’s day, clinching the Cup with a 3-0 win. “We had a gameplan, which was executed perfectly, but most importantly they enjoyed their football and you can see that in how they played,” said Cleves School teacher Mr Smith. An impressive route towards the National Stadium for Colchester United, winning every single game, scoring 11 goals and conceding just two. A 1-0 victory against Cheltenham Town secured their place, with a free-kick in the final moments deciding the game. Team: 9. Harry Amass ©, 1. Riley Doherty (GK), 6. Joshua Popoola, 7. Eden McNicholas, 10. Charlie Jiggins, 11. Harvey North, 12. Harry Falzon, 17. Evan Bastow. Morecambe were certainly made to work for their place in the League Two showpiece after an exciting and topsy-turvy affair against Crewe Alexandra in the regional Final. 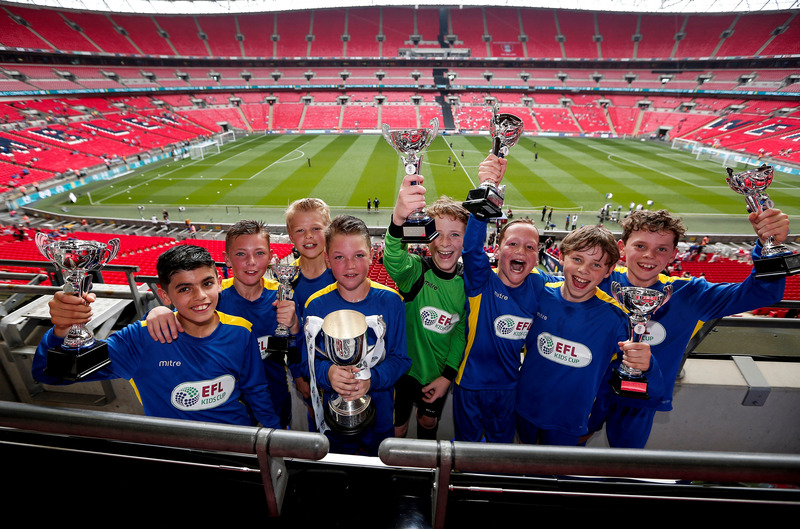 Both sides had led at stages before a dramatic late winner secured St Peter’s C of E a place at Wembley. Team: 8. Oliver Whatmuff ©, 1. Dominic Holden (GK), 3. Noah Jones, 4. Harley Illingworth, 6. Josh Robinson, 7. Adam Fairclough, 9. Scott James Freeman, 10. Alfie Buckley. An evenly matched first period sprang into life on the stroke of half-time, when a brilliant piece of skill from Adam Fairclough left his marker bamboozled. He then provided the finish to match, firing home a fierce left-footed effort beyond the Colchester goalkeeper. 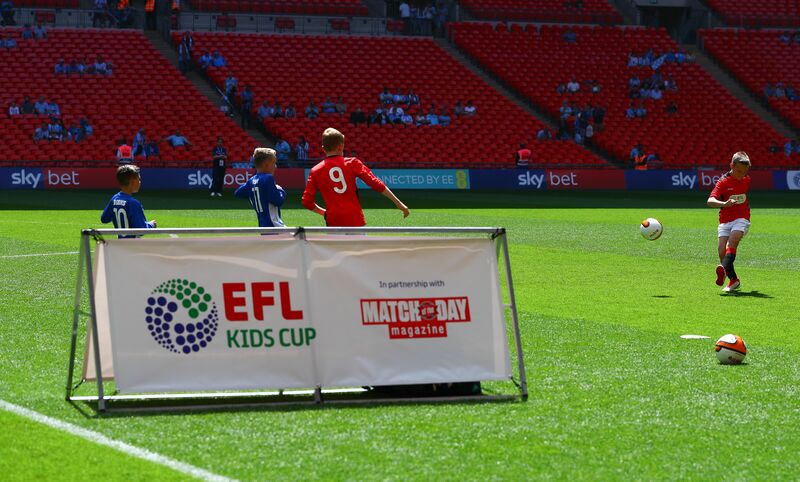 Colchester pushed for an equaliser in the second half but failed to make a breakthrough against a stubborn defence, and so it was the youngsters of St Peters who lifted the EFL Kids Cup up in the Royal Box at Wembley with a 1-0 win. “They’ve trained so hard, and worked so hard in every single game since getting together as a new group in September, and they’ve done absolutely amazingly,” said teacher Natalie Knowles.